Design: A white flag with a thin red stripe running horizontally along the bottom of the flag. In the middle of the flag there is a brown grizzly bear on top of a patch or green grass, and underneath of him are the words "California Republic". Finally, in the top left corner of the flag is a red star with five points. Meaning: The red star is drawn in recognition of California's Lone Star flag of 1836, and the California Grizzly Bear is used as a symbol of "strength and unyielding resistance". The state flag of California is a replica of an important flag in California's history. Before the year 1846, the land that is now California was owned by Mexico and called "Alta California". In the 1840's there was an increase in visitors (both Americans and immigrants) to Alta California, and this made Mexicans that lived in the area tense and uncomfortable. In March of 1846, tensions had risen to a new extreme and a near conflict broke out between the band of U.S. Captain John C. Fremont and Mexican authorities. Captain Fremont and his 60 men had been in Alta California since 1845 on an expedition to explore the land. War between the United States and Mexico seemed unavoidable at this point, and was declared by the U.S. on May 13th, 1846. On June 10th, 1846, a group of American men living just North of San Francisco Bay captured the horses that Mexican General Jose Castro was supposedly going to ride while driving Americans and foreigners out of California. This theft was the first step in what has come to be known as the Bear Flag Revolt. On June 14th, these same American men arrived in Sonoma and took control of the entire town. The Americans took all of the leaders and officers, including General Mariano Vellejo, as prisoners and transported them to Sutter's Fort. At that point, the men that remained (one of whom was William Todd, a relative of Mary Todd Lincoln) in Sonoma created a flag to signify their rebellion. The flag they created had a white field, a red stripe along the bottom edge, a star in the upper left corner, and the illustration of a grizzly bear. They called their flag the "Bear Flag" and named their rebellion the "Bear Flag Revolt". The Bear Flag Revolt only lasted for about a month, and on July 9th, 1846, the American Flag replaced the Bear Flag in Sonoma. California has been a part of the United States ever since, and was officially made a state on September 9th, 1850. Over time, the Bear Flag and the story of the Bear Flag Revolt became sacred and important to Californians. The original Bear Flag came into the possession of The Society of California Pioneers, who managed to preserve it and keep it safe until it was destroyed in The San Francisco earthquake of 1906. 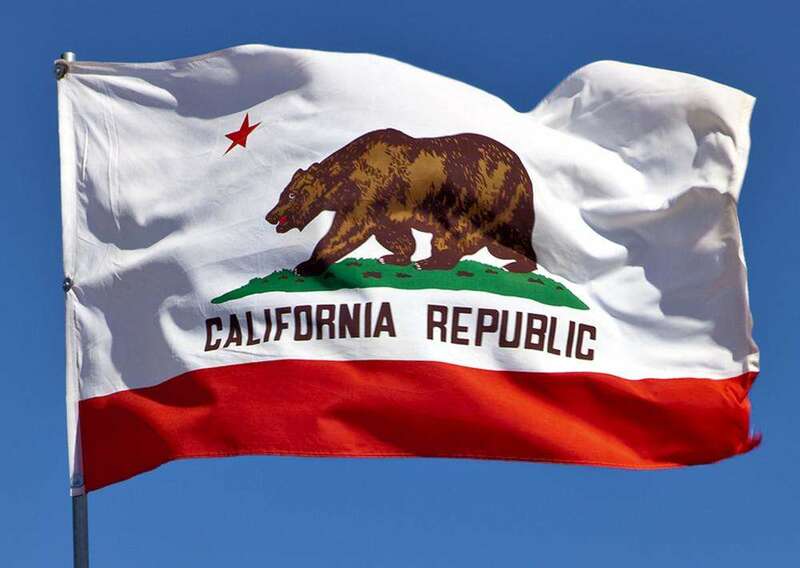 Finally, On February 3rd, 1911, State Senate Bill 291 officially made the Bear Flag the California State flag.